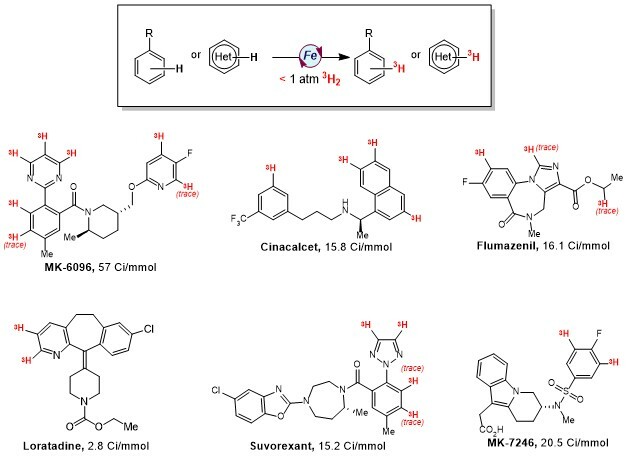 Replacing C-H bonds with deuterium or tritium is a common tool for understanding pharmacokinetic and pharmacodynamics properties in drug molecules and is a critical component of the drug discovery and registration process. For tritiation, metal catalysts that offer predictable site selectivity, operate at low pressures of T2 gas and are tolerant of the many functional groups found in drug molecules are desirable. We recently discovered a new iron catalyst that operates with highly predictable, sterically driven site selectivity and with increased performance at low pressure (Nature 2016, 529, 195.). The site selectivity is orthogonal to commonly used iridium catalysts and is governed by the steric accessibility of the C-H bonds rather than directing groups. Future efforts are focused on improving the handling and functional group tolerance of this class of catalyst as well as design of new first row transition metal catalysts with complementary selectivity for hydrogen isotope exchange.